Visitors to Lagos cannot help but be impressed by its beaches (or praias in Portuguese). Ten (yes, 10!) surround the town and offer everything from scenic, sheltered coves to wide, walkable expanses of sand and sea. 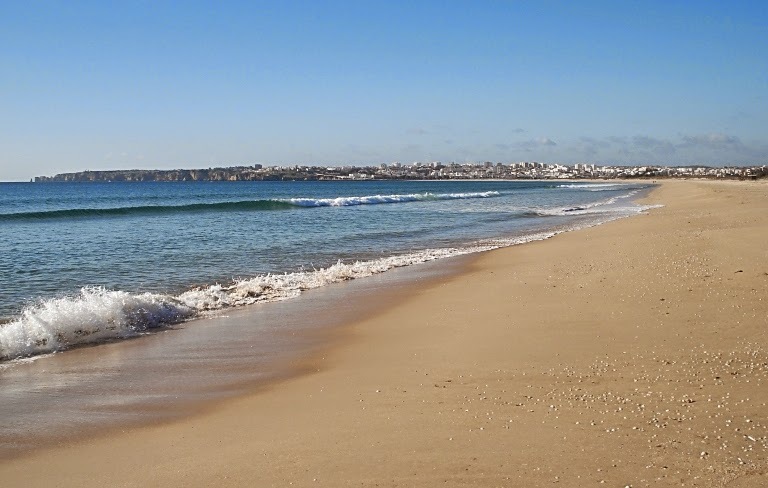 Across from the old section of town and south of the marina is the longest (4km) beach - Meia Praia. We walked along this beach our first full day in Lagos. It was a windy, overcast day and for whatever reason neither of us bothered to take any photos. We did, however, stop to take a pic of this little guy. He sauntered right up and we realized later it's because he associates humans with food. Like many other felines south and east of the marina, he's a stray fed and cared for by local animal rights advocates. Another day another beach...we wandered around the port area and discovered the Praia da Batata. Not that it took all that much discovering on our part. Praia da Batata is known as the town beach. That's the fort in the background and we've spent two afternoons here just soaking up the sun's rays and enjoying the view. If you look carefully in the photo below you'll see Praia da Batata nestled in behind the rock and off in the distance is Meia Praia. Now return your attention to the rock itself. Do you see the two braves individuals who scaled the steep island wall? Well aware that at our age our bones break easy we were content to walk in the sand and enjoy the view from the promenade that's visible on the right. Literally right next door to the Praia da Batata is the picturesque Praia dos Estudantes. There's something for everyone here. Tunnels, nooks and crannies, secluded coves for sunbathing, and even a little exercise as getting up and down requires tackling a fairly steep set of stairs (on left). Yet another day we packed a picnic lunch and headed for the Praia da Dona Ana. We could not have found a more perfect place as the view from our spot on the curved stone wall (visible on the top right) was literally breathtaking. 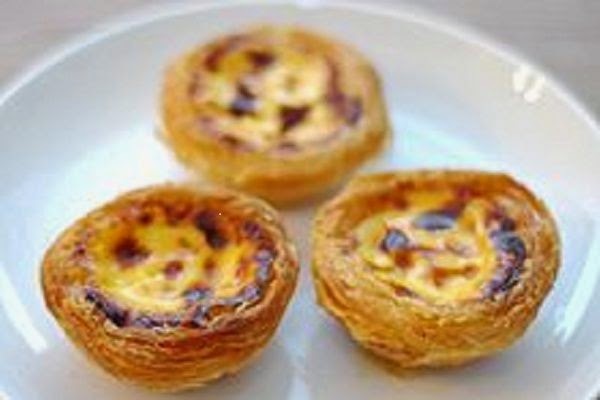 Sidenote: One of John's favourite Portuguese desserts is pastel bata terra sabore which translates to custard tarts. He tasted his first in Albufeira and ever since has made sure to stock up whenever we're at the supermarket or bakery. I was shocked that he included two tarts with our picnic lunch. I wasn't, however, shocked enough to decline! They're absolutely delicious. What isn't surprisingly is that after lunch we both opted not to walk down the fairly lengthy and steep steps to the beach. Going down would not likely have been the problem...coming back up, however, may have required an air ambulance! Not being total slackers ;-) we took the stairs to the right of the apartment building below and walked along the sandy trails that meander along the cliffs back into Lagos. The next beach we've visited, Praia Grande, is wedged between the grottos and rock formations of Ponta da Piedade (edge of mercy). Well aware of my limits, I chose not to descend the staircase to the grottos. John, of course, had no such reservations and away he went. After climbing back to the top he admitted it was a bit of a haul and for the first time since last summer he was actually perspiring! From here we wandered along the rugged point past this modern lighthouse. Its presence is not surprising. The jagged coastline combined with bad weather would be the ruin of most ships. On a good day, of course, kayakers and sightseeing boats venture in and around the rocks. We walked further west, round the point and spotted Praia do Porto de Mos in the distance. Praia do Porto de Mos is our favourite. We've been back a number of times as it's an easy 1.5 km walk from our apartment and these amazing gold and orange cliffs are worth every step. Halfway along are these manmade rock sculptures. Our very first visit we strolled as far we dared and while sitting on a flat rock munched on our picnic sandwiches and enjoyed the sea, scenery and glorious sunshine of Praia do Porto de Mos. Having polished off yet another custard tart each, it seemed fitting we should walk to the far end of the beach. There, just below that far cliff we spotted three boggie boarders. Midway back we stopped to savour the moment. It just didn't seem proper to return home without checking out the beach bar. We've since returned numerous times and I'm happy to announce they serve a great Long Island Iced Tea! This selfie was taken at the beginning of February when the temperatures were cooler, but regardless of the time of year the beaches and shoreline of Lagos are truly memorable.